In 2015 the National Immigration Institute (INM) introduced the Tourist Card. According to the Forma Migratoria Múltiple, it is an admission document issued to vacationing visitors of certain nationalities. It is also popularly known as a tourist visa, even though it is not officially a visa. Applicants will receive their Tourist Card via email after filling the application form. iVisa offers this service because many of our clients have had issues with long lines at the airport to pay for the card and our service will help you avoid the queue. In addition, obtaining this card means you don’t have to fill the form aboard the plane or when you arrive at an airport in Mexico. In summary, getting this card in advance could save you time, but please note it is not obligatory and carries a service fee. The immigration official at the port of entry will usually grant you a 180-day stay. The Tourist Card (FMM) may be issued for up to 180 days and is issued per person, including children. The Tourist Card (Air) is free for all passengers traveling by air with a major commercial airline. -The Tourist Card (Air) is PER PERSON so if there are four people traveling, all four need a separate Tourist Card with their information. You can apply for a Tourist Card within 30 days of your arrival in Mexico. If you are flying to Los Cabos International Airport, please print your Tourist Card (Air) double-sided on one piece of paper. What do I need to apply for the Tourist Card (Air)? What is the cost to obtain a Tourist Card (Air)? How long does it take to process a Mexico Tourist Card (Air)? How long is the Tourist Card (Air) valid for? 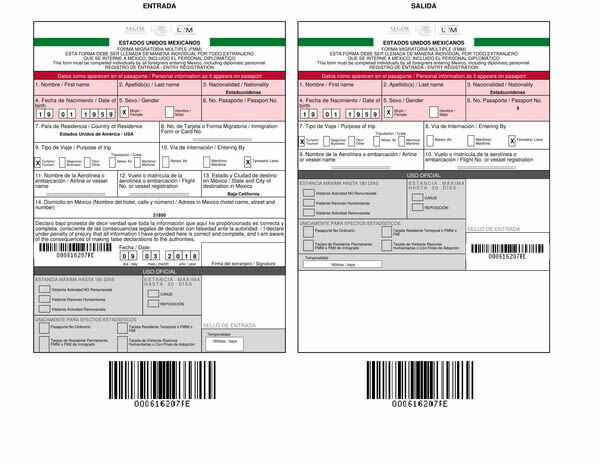 The Mexican Tourist Card (Air) is valid for 180 days after arrival. It allows for a single entry with a maximum stay of 180 days. How many times can I use the Tourist Card (Air)? You can use it only once, as its valid for a single entry only. I am arriving by car, can I use this Tourist card? You must apply for the Tourist Card (Land) if you are planning on arriving in Mexico by car, which you can obtain by clicking here. Yes. However, travelers who want to apply for a Tourist Card online MUST apply with their passport from the eligible country. A trip to Mexico may be precisely what you need after a year-long of work and stress. The country offers gorgeous landscapes, a lot of fun parties, and you can relax as long as you want with a cold beverage on a white sandy beach. Surely you long for that more than anything else. However, there are some things that you should probably know before traveling to Mexico. Each country has its own pros and cons, and Mexico is no different. Even so, there is nothing out of the ordinary, and I am sure you are going to learn everything right away. We should probably open with communication. In Mexico, people speak Spanish. The common misconception is that Mexicans speak Mexican, but that is not even a language. They speak Spanish. It may not be the same Spanish people have in Spain, but Americans do not speak the same English British people do. I suppose you see the analogy. In some regions such as Cancun, people speak English, and you can understand each other pretty well. However, in other areas, Mexicans do not know a word of English. That is why you should learn some basic expressions and phrases before you go to Mexico. It will save you a lot of time. When you get to Mexico, make sure that you are extremely cautious when you want to cross the street. Some may go as far as saying that it is an extreme sport. Why? Because drivers do not care about pedestrians. Even if the light is green, although there are very few lights for pedestrians, drivers will either ignore or block you. The secret of a safe street crossing is to wait. Just make sure that no car is near and then cross the street. Otherwise, you may end up in the hospital with some severe injuries. Mexicans have a very long way to go until they get this thing out of their system. One thing that you should probably know is that the life in Mexico revolves around food. Mexicans are avid foodies and everyone will want to feed you. But there is a good side to that as well. You may have Mexican food in your country of origin, but it does not even begin to compare with the food you find in Mexico. The spices and the aromas will make your taste buds addicted, and you will always crave for some more. However, you need to be careful with the food. Apart from staying away from the shady street vendors, you need to take it easy in the first few days in Mexico. That is because your stomach is not prepared for the real Mexican food. Eat just a little in the first two days, and then you can go heavy-duty. That is because you may get sick and spend your vacation in your hotel room feeding the ducks. I am not even kidding. As long as you take it gradually, you should be fine. Speaking of things that go inside your stomach, you should proably avoid the tap water as well. It is not exactly high-quality, which is why you should always carry bottled water. Of course, the water is ok in some regions, and you can use it to brush your teeth, but people usually do not want to take their chances. One thing you should remember about Mexicans is that they are incredibly loud. They have a high voice tone, they laugh loudly, and it does not matter what time it is, they will act as if it is the middle of the day and they are having a party. They do not concern themselves with things like maybe they are bothering someone. This is not necessarily a bad thing because Mexicans are joyous people and they will transmit their state of mind, but if you are trying to sleep, it is kind of difficult to do it when at 3 AM some people are having a party. You may be wondering when it is the best time to go to Mexico. It really depends on where you want to go. Summers are very hot and the water is very nice. However, contrary to popular belief, Mexico is not all about high temperatures. After all, Mexico is a large country, and they still have some areas where it snows although this is rare. So, if you want beaches, summer is the best moment for you. If you cannot stand the heat, spring and autumn are the best. One of the things that you are going to love in Mexico is the people. They are all so friendly, and if you walk into a house, you will be fed, of course, and welcomed. Plus, Mexicans are more likely to talk to strangers on the street than most nationalities, which is lovely. They make friends easily. There is this talk about Mexico being a dangerous destination, and while bad things do happen, it is a relatively safe place. It depends on where you are going. Another useful tip concerns public transportation. The schedule is chaotic because there are no specific times when buses arrive. That can be annoying because you may have to wait 5 minutes for a bus or a whole hour. It is curious how that is possible, but I would not rely on public transportation as much. Especially if you need to get to the airport. Also, do not rely on your credit card too much. Many places do not have a POS or do not accept cards or checks. You should always carry some cash on you. Plus, you need to notify your bank before traveling to Mexico. You do not want to wake up in Mexico without any money. Hopefully, the tips above will be useful for your trip to Mexico, and while the list can go on, this article covers the basics. What you need to remember is that getting around in Mexico is relatively easy, and people are willing to help you out with directions and whatnot. Just enjoy the food and the joyous atmosphere. You will have one hell of a time.